A sculpture dedicated to victims of knife crime has been temporarily installed at Coventry Cathedral. It was unveiled in 2017 and was displayed in Liverpool and Hull before arriving in Coventry. Artist Alfie Bradley, who created the sculpture at the British Ironworks Centre, said it was a “monument against violence and aggression”. 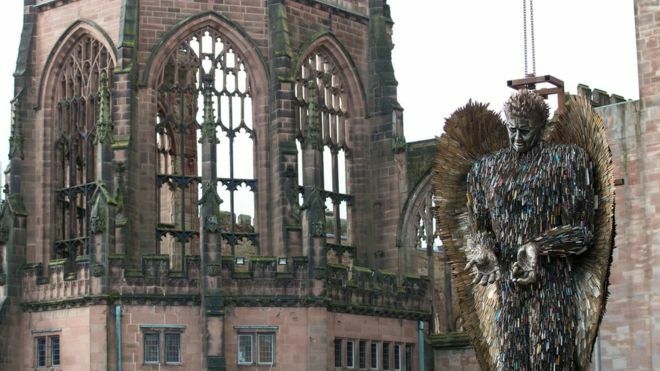 The Bishop of Coventry, Rt Rev Dr Christopher Cocksworth, said the Knife Angel was “a stark reminder of a form of violent crime infecting our city and threatening lives with great danger, especially our young people”. Messages from families of the victims of knife crime have been engraved on the sculpture’s wings. Mr Bradley, who created it at the British Ironworks Centre in Oswestry, Shropshire, said it was “a memorial to those whose lives have been affected by knife crime”. The sculpture will be displayed in Coventry until 23 April.